One of the Sunset Strip’s most infamous legends is that the Piazza del Sol, an Italian Renaissance-style building at 8439 Sunset, was once a brothel – that the entire building was a lavish pleasure palace operated in service to Hollywood elites. Google “Piazza del Sol” and you’ll come up with variations of this: “Built as the Hacienda Arms luxury apartments in 1927, the building shortly thereafter started housing the ‘House of Francis,’ the movie industry’s favorite ‘house of ill repute’ and site of a notorious vice bust.” Similar descriptions appear in dozens of books and online articles about the Sunset Strip and Hollywood scandals. How does a myth like this become accepted fact? In this case it may be because there is so little reliable information available about Lee Francis and her history with the building. There are a few news stories from the time, and there’s Lee Francis’ memoir, “Ladies on Call,” which is long out of print and hard to find. And not much else. But Lee Francis and her citadel of sin is a popular topic in books and articles on Hollywood scandals. Among these, a frequently cited book is “The Fixers: Eddie Mannix, Howard Strickling and the MGM Publicity Machine,” by E.J. Fleming. Published in 2005, “The Fixers” covers Francis in just seven or so paragraphs. Unfortunately, much of this information is inaccurate and confusing. Here is a breakdown of the coverage of Lee Francis, fact-checked against news accounts and Francis’ book. Partly true. In her memoir, Lee Francis said she worked in San Francisco and Reno before arriving in Los Angeles around 1920. 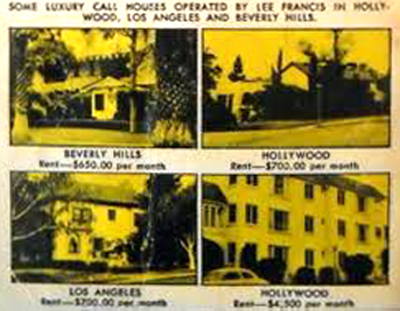 In LA, she ran brothels in a series of mansions – she mentions one on Bedford Drive in Beverly Hills, for example, where she operated in 1936, and another on Kings Road – and at least one apartment building on the Westside. Her clientele included movie stars and studio executives as well as leaders in the downtown establishment. Amenities at the houses included swimming, tennis, billiards, drinks and fine dining as well as female companionship. But she didn’t own these places. As Francis explained in her book, she was at constant risk of having to move house overnight when neighbors realized she was operating a brothel in their ritzy enclaves. “Often the police would come to me and advise me to move,” she wrote. There wouldn’t be time to sell and then buy a new place. So what was Lee Francis’ connection to the apartment building at 8439 Sunset? She said she leased an apartment there for a brief time, likely starting in 1937 when she gave up her last house in Beverly Hills. She was downsizing her business then, with the intent of going legit and opening a nightclub. During the time Lee Francis rented in the building it was owned by Phil Goldstone, former head of Tiffany Pictures (a “Poverty Row” studio) and a resident of the building. 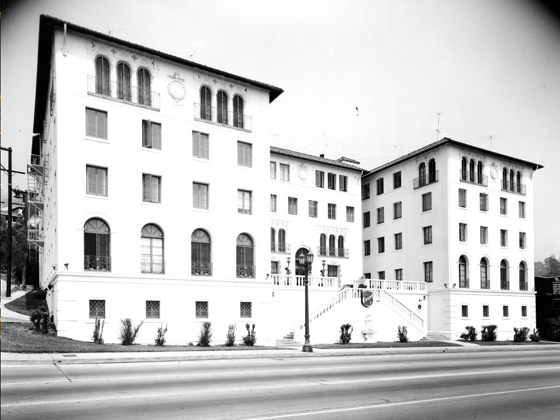 Around August 1939 Goldstone changed the building’s name from the Hacienda Park Apartments to the Coronet Apartments. Francis kept smaller houses near the Strip for her call girls’ rendezvous – including a small house she had owned since the early 1920s a half mile south of the Strip on Norton Avenue. There were likely others, including a house in the 8200 block of Sunset, about a half mile east of the Coronet. Mostly false. Francis did have close ties with law enforcement and government officials. Not long after she arrived in Los Angeles she caught the eye of crime kingpin Charlie Crawford. He not only set Francis up in business running high-class brothels, he showered her with gifts, including the small house on Norton Avenue in West Hollywood. Paying for protection was a cost of doing business. It’s true that she likely paid out 40% or more to Crawford and his network of corrupt cops and politicians. This made Francis and the vice cops partners, more or less, and answerable to the same bosses downtown. It’s possible but seems unlikely that she would have “allowed” them to conduct fake raids on her houses. It’s even less likely she answered the fake raids by entertaining the cops in the Coronet’s lobby. 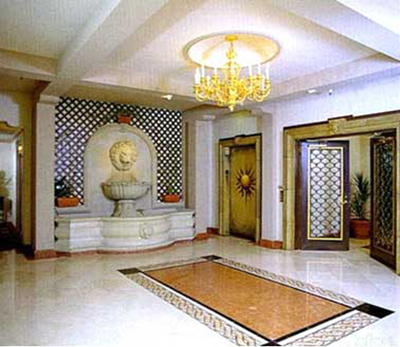 The lobby was a public space, and the cops would not have wanted the tenants, including the resident-owner, Phil Goldstone, seeing them there taking cash from Francis while helping themselves to her caviar and champagne. Doubtful. Early 20th century Los Angeles was rife with hidden-in-plain-sight, corrupt goings-on, particularly high-stakes gambling and prostitution. It’s true that these activities rarely made the news – unless or until there were raids and arrests. Reporters were underpaid, so might have been susceptible to bribery, but there were many of them – dozens reporting for the five or six daily papers and wire services – so it seems unlikely they would all conspire in unison to keep Francis’ business secret. Francis opened her first brothel sometime after 1920. The Hacienda Park, later Coronet, did not open until 1927. 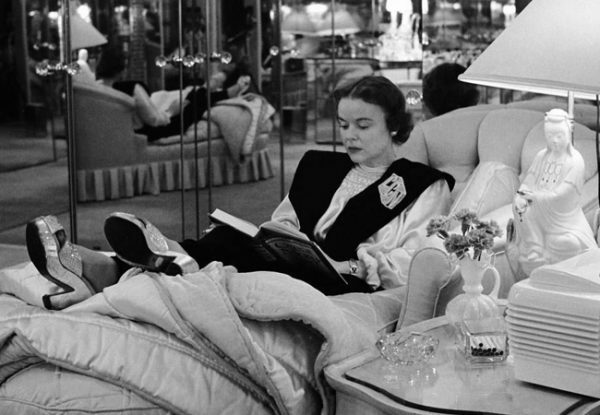 As noted, Francis said she gave up her last house around 1937, and there’s no indication in her book that she lived at the Coronet before then. She may have run the “most famous brothel in California,” but it wasn’t the Coronet. Mostly false. Call girls likely did live in the building – just as they lived in the Sunset Tower, Chateau Marmont and other luxury buildings – but they conducted their business elsewhere, mostly in hotels. Plus, residents in the building over the years included a healthy mix of single people and married couples as well as families with children. Movie stars like Loretta Young, Jeanette MacDonald and Marie Dressler lived there, as did wealthy people like Phil Goldstone and Ada Wharton, whose foster son, dress designer Paul Ivar Wharton, was murdered there in 1935. It’s more likely here that “The Fixers” elided services offered at the mansions Francis leased – the bars, billiards and dining and even lodging for the women who worked there – into the construct of the Coronet as a one-stop prostitution mall. There’s no record of a restaurant operating in the building before 2002 when Katana, a Japanese eatery, opened in the east-front apartment on the first floor – the same apartment where Paul Wharton was killed. The lobby may have resembled a five-star hotel, but the interior of the building was destroyed by fire in 1983 and no photos of its original appearance are known to exist. It is also possible the women who worked for Lee Francis made $1,000 a week, which would be about $18,500 today. She said they made $200 a night on average. But after the house took its customary cut, their take home pay was likely half that amount or less. Among the stars who frequented Francis’ establishments in the 1930s, according to “The Fixers” – Lee Francis used very few real names in her book – were Errol Flynn, John Gilbert and Clark Gable. One star Francis mentioned by name was Jean Harlow, who Francis said would pay her handsomely to take the place of the prostitutes and service Francis’ clients. False. 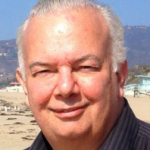 On his website, Movieland Directory, “The Fixers” author E.J. Fleming says the arrest occurred on Sept. 21, 1931, not 1930. He also gives the location as 8428 Sunset Boulevard, which is about a half-block east and across Sunset from the apartment building, not in the alley. Neither the Times nor the wire services reported the arrest – but then Tracy was not yet a big star. By contrast, when he was arrested for drunkenness in Nevada in March 1935 the story was reported in the Times, Nevada newspapers and the Associated Press. And again, Lee Francis wrote that she didn’t move to the 8379 Sunset building until the late 1930s, when she decided to quit the business of running brothels. Her decision to go legit may have been related to big changes around that time among the overlords of the underworld in the Los Angeles. After her benefactor, Charlie Crawford, was murdered in 1931, the gambler Guy McAfee, a former LAPD vice squad captain, assumed control of gambling, prostitution and other rackets. A few years later Ben Siegel, the infamous “Bugsy,” arrived from the east on a mission to consolidate West Coast crime into the national syndicate. His pathway was cleared, quite unexpectedly, when McAfee and his partners were rousted out of town during a wave of political reform. Their departure, mostly to Las Vegas, left the vast spoils in the region to Siegel and his partners back east. While Lee Francis was a top earner, she could have been tainted in Siegel’s eyes because of her ties to the old regime. If so, this exposure may have hastened her decision in 1937 to go legit. She decided to open a nightclub on the Sunset Strip and negotiated with the owner of a vacant lot at 8588 Sunset, a block or so west of the Coronet, who built the nightclub on it to her specifications. She hired designers and contractors to finish the interior and hired staff. She called it Club Versailles. In December gossip columns reported – without mentioning Francis’ name – that the club was set to open. The club opened a few months later as Phil Selznick’s – Selznick, the proprietor, was a cousin of David O. Selznick, the producer of “Gone with the Wind” and many other classic films. The name was changed to Club Versailles a few months later, but then in February 1939 it closed for good. New owners undertook a top-to-bottom, inside-out renovation, and the Mocambo nightclub opened at 8588 Sunset in January 1941. Mocambo soon became one of the most successful clubs of the Strip’s golden age. For Lee Francis, after she lost the Versailles, things went from bad to worse. Toward the end of 1939 a man posing as a former client phoned Francis seeking a date. A rendezvous was set at Francis’ little house on Norton Avenue. But at the appointed time when she answered the door knock, rather than the johns she was expecting, Francis was confronted by a squad of sheriff’s vice cops. Francis and two women she employed were arrested. Mixed. Francis wrote that she was arrested by LAPD Officer Rittenhouse at her apartment. In fact, Charles Rittenhouse was a deputy sheriff on the vice detail. According to the Times, the arrest occurred on January 17, 1940, when sheriff’s men “raided a residence in the 8600 block of Norton Ave. and arrested three women on suspicion of morals offenses” including Lee Francis, 45. (There is no 8600 block of Norton, which ends at the 8200 block, at Sweetzer.) There weren’t dozens of people in the house – just three. And of course if Lee Francis really was 45 years old she couldn’t have had a”40-year career” in prostitution. 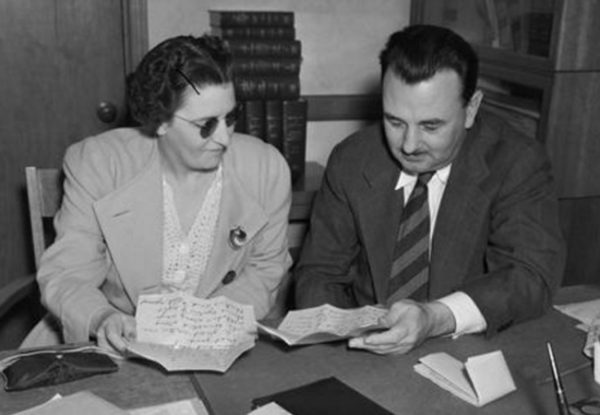 LaVonne Cohen, former Sunset Strip prostitute Simone King, who was arrested with Lee Francis in January 1940, shown here as wife of mobster Mickey Cohen, reading in their Brentwood home. During Francis’ trial, the building manager of the Coronet testified that Dep. Rittenhouse made multiple visits to the building and spent most of his time in the switchboard room – the implication being that he was eavesdropping on Francis’ phone calls. Evidence from wiretaps had recently been ruled in admissible at trial by the U.S. Department of Justice. When Rittenhouse took the stand he denied tapping Francis’ calls, claiming instead that he overheard her setting up dates by listening at her front door. On March 21, 1940, Lee Francis was found guilty. She was sentenced to 30 days in jail and fined $250. Interestingly, a little over a year later Dep. Rittenhouse was exposed as having corrupt ties to the gambler Eddie Nealis, Bugsy Siegel’s would-be rival and a holdover from the McAfee regime. In May 1941 he was indicted on 61 charges of taking bribes in a large-scale bookmaking protection racket run by Nealis in West Hollywood. After a lengthy trial, however, Rittenhouse was declared not guilty on all charges and was later reinstated by Sheriff’s Department. 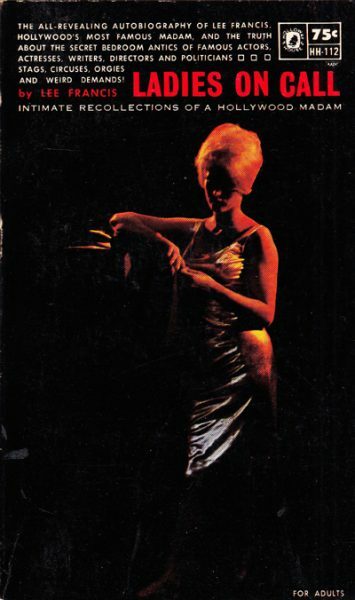 Before her arrest Lee Francis had found work as a hostess in a popular nightspot called The Club on Beverly Boulevard. Whether she kept that job after she left jail and continued to live at the Coronet is not known. She eventually returned to the outcall business, but from that point forward she kept an even lower profile than before. The Garden of Allah became a favorite spot for her call girls’ assignations, which was both a product and cause of the decline and eventual demolition of the one-time celebrity hive. In what may have been her last public appearance, Francis herself arrived with an entourage of her call girls at the hotel’s closing night party in August 1959. She finally published her book, “Ladies on Call,” in 1965, when she was about 70 years old. Today the book is out of print, very rare and expensive.